Cincinnati, OH -- ILSCO is pleased to announce that its line of ILSCO Solar products for grounding have received UL2703 Certification. Our solar grounding products are used in utility, commercial and residential scale projects and ILSCO responded to our customers’ requests to secure this Certification. UL2703 Certification is specific to Rack Mounting Systems and Clamping Devices for PV Modules and Panels. To attain this certification our products were subjected to extensive testing, including temperature and humidity cycling followed by electrical resistance and conductance analysis, to ensure durable electrical bonding in outdoor environments. ILSCO Solar offers a variety of styles in our groundingsolution offering and uses materials such as tin plated copper and stainless steel to ensure lasting connections. ILSCOproduces these products in the U.S.! Below you will find more information on the features and benefits of each of our solar groundingsolutions. The SGB-4 SGB-5 (UL 2703 Recognized) are unique, patent pending, aluminum connectors with stainless steel screws. 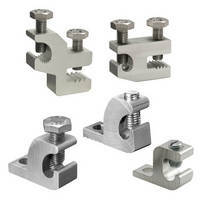 The built in clamp eliminates the need for mounting hardware and speeds up installation time. The GBL-4DBT GBL-4DBTH (UL2703 Listed) are tin plated copper connectors with stainless steel screws. These connectorsare rated for direct burial and have been the standard in the solar industry for several years. The GBL-4DBTH features an easily accessible hex head screw vs. a standard slotted screw on the GBL-4DBT. The GBL-4SS (UL 2703 Listed) is an aluminum connector with stainless steel, slotted screw. The recent UL 2703 Certification asserts ILSCO’s position as an industry leader as a manufacturer of grounding, bonding and connectivity solutions to the solar industry. Reciprocating Saw Accessory aids in right angle cutting. Vacuum Clamping System aids wooden workpiece handling. Automated System promotes quick-change clamping.